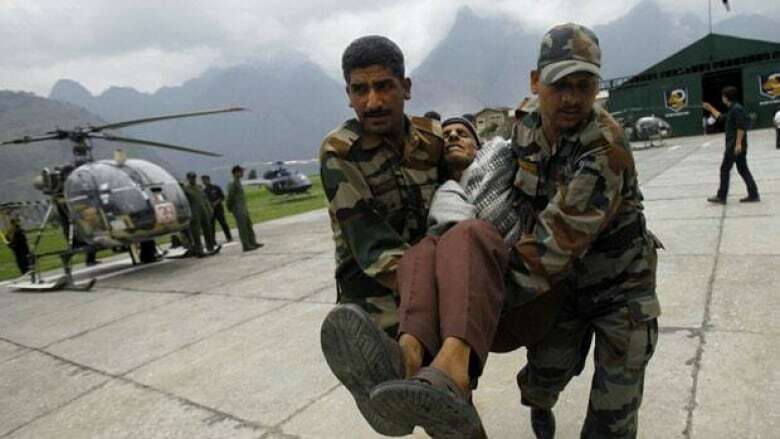 Soldiers recovered more bodies as they cleared debris in villages flattened by landslides and monsoon floods in the northern Indian state of Uttarakhand, bringing the death toll from torrential rains above 1,000, the home minister said Monday. Army officials suspended rescue operations after bad weather early Monday reduced visibility in the mountainous area. Army troops are attempting to rescue more than 10,000 stranded people, many in the temple town of Badrinath. Two landslides early Monday blocked roads that had been cleared by soldiers only a few days earlier. "We are just waiting for the weather to clear up and visibility to improve before the aircraft can take off," said R.S. Brar, an air force official in Dehradun, the capital of Uttarakhand. Meteorological officials predicted more heavy rain in Uttarakhand over the next few days. Home Minister Sushikumar Shinde told reporters that the death toll will exceed the figure of 1,000 given Sunday by the Uttarakhand government. More bodies were being found as troops and disaster rescue teams cleared debris from buildings and houses destroyed by flood waters, Shinde said. The unprecedented heavy rains triggered landslides and floods in the Ganges River last week, washing away thousands of houses and roads and cutting communication links in large areas of Uttarakhand. Uttarakhand is a popular summer vacation destination for tourists seeking to escape the torrid heat of the plains. It is also a religious pilgrimage site with four temple towns in the Garhwal Himalayan range. Most of the people stranded in Uttarakhand are Hindu pilgrims at the four revered shrines. The tourists usually return before monsoon rains begin in July. But this year, early rains caught hundreds of thousands of tourists, pilgrims and local residents by surprise. Twenty other people died from monsoon floods in Uttar Pradesh state. Across the border in Nepal, the home ministry said at least 39 people died and 20 others were missing in landslides and monsoon flooding. Flooding is an annual occurrence in India, which depends on monsoon rains to sustain agriculture. But the heavy downpours also cause extensive loss of lives and property.